Step-by-step learning guide shows you how to get the most out of your TI Programmable 58 or 59. In step-by-step fashion, Personal Programming takes you through a self-paced course, from simple techniques to advanced programming details. You’ll learn how to put the programs in your Master Library Module to work immediately. How to teach the calculator to remember and execute your programs. And, how to use its power when programs aren’t needed. A comprehensive selection of examples allows you to apply the power of programming to your particular personal or professional interests. Prove to yourself how easy and effective programming can be with this easy to understand learning guide. 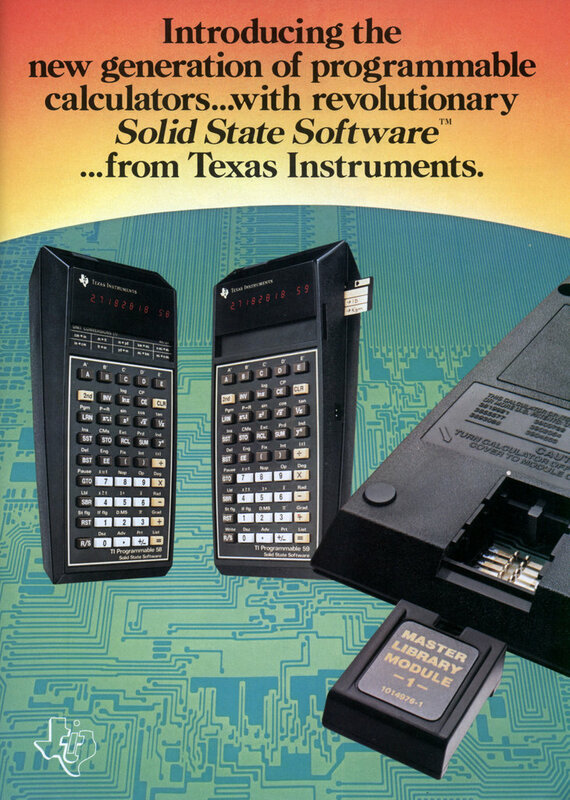 Texas Instruments unique algebraic operating system makes the calculator part of the solution, not part of the problem. AOS is more than just algebraic entry. It’s a full mathematical hierarchy coupled with multiple levels of parentheses. This means more pending operations, as well as easy left-to-right entry of expressions — both numbers and functions. This is the universally recognized order of performing calculations. Functions first. Powers and roots. Multiplication or division. Then addition or subtraction. AOS performs calculations in this order automatically. But, you have the option to change the order whenever you wish by using the parentheses keys. AOS remembers the numbers and functions in its pending operation stack. And processes them according to mathematical hierarchy. As more operations become pending, the stack fills up. As operations are completed, the stack empties into the display. The case for AOS is strong. That’s why TI chose it. We think you’ll prefer AOS. Because you begin using it immediately. There’s no new language to learn. And, even if you are already conditioned to some other form of entry system, the added value and power of TI’s programmable calculators with unique AOS is well worth the easy transition. Compare the power and features of the TI Programmable 58 and 59 with any other programmable calculators available today. When you Buy a TI Programmable 58 or 59. A $35 value if you act now. Leisure Library includes plug-in Solid State Software module, library manual, quick-reference guide, label cards, and library wallet. 19 fun prog-rams: Football Predictor. Bowling Scorekeeper. Golf Handicapper. Bridge. Chess Rankings. Codebreaker. Blackjack. Acey Ducey. Craps. Mars Lander. Jive Turkey. Nim. Sea Battle. Quarterback. Photo I and II. For use in conjunction with the PC-100A there’s Hangman, Memo Pad, Biorhythm, Computer Art. Offer good from August 15 to October 31, 1977. Plug-in library modules give you up to 5,000 additional program steps! A new dimension in micro-memory technology. TI’s state-of-the-art Solid State Software™ libraries combine the advantages of prewritten programs with the convenience of compact, easy-to-use, plug-in modules. Information that once required up to 25 magnetic cards can be contained in one small module. Simply insert the desired module and access a program in seconds, with just a few keystrokes. They bring the power of programming within easy reach, even if you have never programmed before. Use the 5,000-step module by itself. Or, use it as a base and call subroutines from your magnetic card or keyed-in program. You can also use your program as a base and call subroutines from the module. And much more. The Master Library Solid State Software™ module is included with the TI Programmable 58 and TI Programmable 59. A selection of 25 prewritten programs in mathematics, statistics, finance, and other application areas, it provides the professional with a “tool kit” of preprogrammed solutions to a wide variety of problems. Optional Solid State Software™ plug-in libraries let you customize your TI Programmable 58 or TI Programmable 59 into a specialized problem solver. Choose from Statistics, Real Estate and Investment, Surveying, Aviation, Marine Navigation. PPX-59 lets you share programs. TI’s Professional Program Exchange (PPX) makes hundreds of programs available to you. Programs developed, tested, and submitted by your professional peers. And, you can submit programs you develop for possible inclusion. Your yearly PPX-59 membership provides you with a source catalog, 3 free programs of your choice, a bi-monthly newsletter, and a member’s guide and program submission forms. Send for free 16-page brochure. Want to know more? This 16-page color brochure is packed with information on TI’s new handheld programmables. Contains detailed descriptions and specifications on these exciting calculators. For your free copy write to: Brochure Offer, Texas Instruments, P. O. Box 53, Lubbock, TX 79408. The PC-100A turns your TI Programmable 58 or 59 into a quiet, high-speed printing/plotting calculator. The PC-100A prints fast. Over 60 characters/second with its quiet thermal printer. So you get listings fast. Just push the LIST key for a printout of the entire program memory. See each program step executed. Push the TRACE key. Now every calculation that’s performed in your program is printed. The full number and the operation. Printed headings for your programs provide easy reference and identification. You can even annotate data on printouts. Use the alpha printing capability of the TI Programmable 58/59/ PC-100A combination to enter prompting messages right in your program. The PC-100A allows you to input data from your TI Programmable 58 or 59 and plot curves and histograms. You can make a plot of data directly from the calculator keyboard or automatically from a program. List registers. Program labels. There’s even a handy, built-in battery charger for your calculator’s battery pack. Whether for school, technology, or business and finance, the uses for the PC-100A are limited only by your imagination. Continuing revolutionary advances from Texas Instruments … the leader in electronic technology. When you judge the value of a high-technology product, it pays to look closely at the company behind the product. 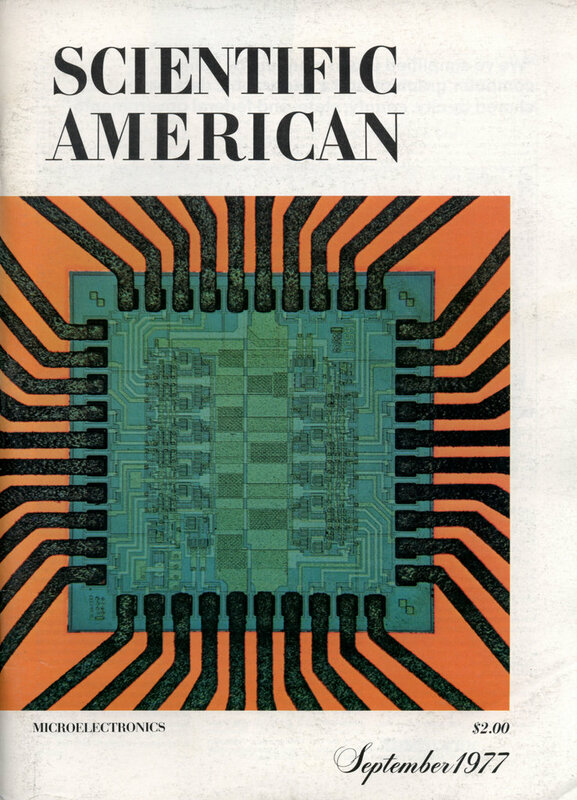 TI invented the original integrated circuit and the “calculator-on-a-chip” that ignited the calculator revolution. As the world’s leading producer of integrated circuits, TI holds the basic patent on the miniature calculator itself…and is a world leader in the production of electronic calculators. Performance. Capability. Quality. Value. TI. I had a subscription to the Scientific American at this time and I still have a copy of this particular issue. I was just blown away by both the articles and the advertisements ( I lived in India at that time). I made up my mind after reading this issue to get into computer science – which is exactly what i did later in life. The TI-59 was the one thing that i coveted the most (apart from the Apple II. The Apple ad in this issue is also amazing.